Yesterday I picked up a few items for my mother-in-law, who seems to restrict her driving to the nearby grocery store. After dropping off the purchases at her house, I was reimbursed – rounding up – with a crisp, new, twenty-dollar bill. That bill went straight into my wallet, nestled alongside a couple of paper receipts. But on the drive home I thought to myself, “What am I going to do with twenty dollars?” Not the money, mind you – the bill. For many of us, this is what it’s come to: cash is a nuisance instead of a convenience. Use that twenty-dollar bill for a purchase and what do you get in return? “Change” – more bills than you had in the first place (and a few of those little round coin thingy’s). It’s the modern-day definition of “cash flow problem”. The coins go into the car “ashtray” (what’s that?) to gather dust. The bills go into the wallet or purse, where they take up more real estate than they deserve. Speaking of wallets, the contents of mine have been reduced to a driver’s license, two credit cards, a bank card, and a (paper) insurance card. Even if my wallet had a “billfold” pocket, there wouldn’t be anything in it. You could say I choose to be strapped for cash. Instead, my phone slowly absorbs my wallet: payment apps, photos, and ID cards; all formerly parked behind the leather inside my front pants pocket. Of course, I’m not alone. 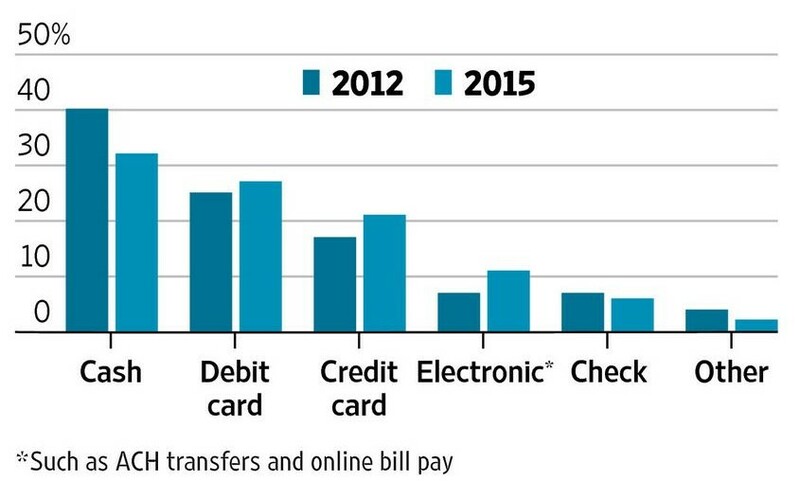 As the table suggests (from the Wall Street Journal article Should We Move To a Mostly Cashless Society?) we’re using other means to defray our expenses. Cash and checks, please step aside for the more popular debit, credit, and electronic alternatives. Note the table is already three years old, so it’s safe to say “Electronic” is an even taller column today. I know it’s been years since my kids wrote a check (if they ever did). Their data-driven world prefers Venmo, Apple and Google Pay, PayPal, and the like. How about a couple of surveys to support the cash-is-no-longer-king society we live in? The first – 2,000 respondents (smartphone owners) – says they conduct more transactions with their phone than they do with their cash. The second claims four in ten merchants will soon take payment through “digital wallet” apps (if they don’t already). Stack and rack those bills, people; cash is officially old-school. One more data-point for you. This survey shows how much (or how little) cash we carry around these days. The age range of the 2,000 respondents is 19-71. I’ll bet my $20 the 71-year-old’s lean toward the yellow ($21-$50) while the phone-gripping teens lean toward the blue ($10 or less). Frankly, I think there should be a fourth color for $0. In defense of greenbacks, I still come up with two reasons why I occasionally need cash on hand. The first: tips for on-the-spot services (i.e. rental car shuttles). Perhaps one day Avis will include tipping in its app – like Starbucks does – but for now it’s still gotta be cash. The second reason: the needy – spontaneous gifting for those street-corner-dwellers (especially this time of year). Without cash, I’ve got nothing to give. No surprise, both of my reasons are included in the article 7 Reasons You’ll Always Need Cash The other five? Small-business purchases (i.e. farmer’s markets or lemonade stands); “managing a tight budget” (more of a strategy than a reason); “when technology fails” (which admittedly, happens now and then); “when you need to remain anonymous” (witness protection program, anyone? ), and “in case of emergency” (in other words, buying yourself out of a problem). I choose to play the odds, as I don’t pass enough lemonade stands or find myself in enough compromising situations to merit a $20 in my wallet. I can still run pretty fast. Speaking of my mom-in-law’s $20, I shifted the bill from my wallet to my wife’s purse as soon as I walked in the door. It wasn’t a reflex move (I swear). It’s just, my wife “bucks” the trend – ha – and prefers a “stash” of cash at her fingertips (or maybe under the mattress? I should go check.) In other words, if you’re looking for a handout, you know who to go to in this relationship. As for me, I’ve officially cashed out. This entry was posted in culture, technology and tagged Apple Pay, cash, credit card, debit card, defray, digital wallet, dollars, Google Pay, Paypal, Venmo. Bookmark the permalink. Tandy and I are the opposite – she rarely has cash and I always try to. Though the trips to the ATM are getting farther and farther apart as that cash gets used less and less. I actually still like cash…but then I am old-fashioned. I find it effective for not overspending…..when you run out of bills, you just stop spending until more money comes in. It’s more of a psychological thing. Besides I am one of those people who balances their account regularly so it’s a pain to keep track of all those debit slips. I don’t pay with apps either as my basic cell phone plan is only for emergencies. Like I said, I’m old, but I know I will be forced to change someday when money becomes obsolete. I read the other day that the Salvation Army is trialing debit machines in their Christmas kettle campaign as so many people don’t carry cash anymore that donations are down substantially. Salvation Army debit machines? Wow – definitely not on-board with that idea. If I’m not handing cash to a bell-ringer, I might as well write a check and send it through the mail. So impersonal. Despite my musings, I think cash is here for at least another couple of generations. There were several surveys/tables I didn’t include, indicating consumers close to or below the poverty line use cash in much higher percentages and in many more situations than most. I need to be reminded; there are those who don’t qualify for credit cards or can’t afford cell phones. I understand your point re cash, but if it is more of a nuisance please feel free to let me take it off your hands. Just the sort of response I expected from you, Krafty.